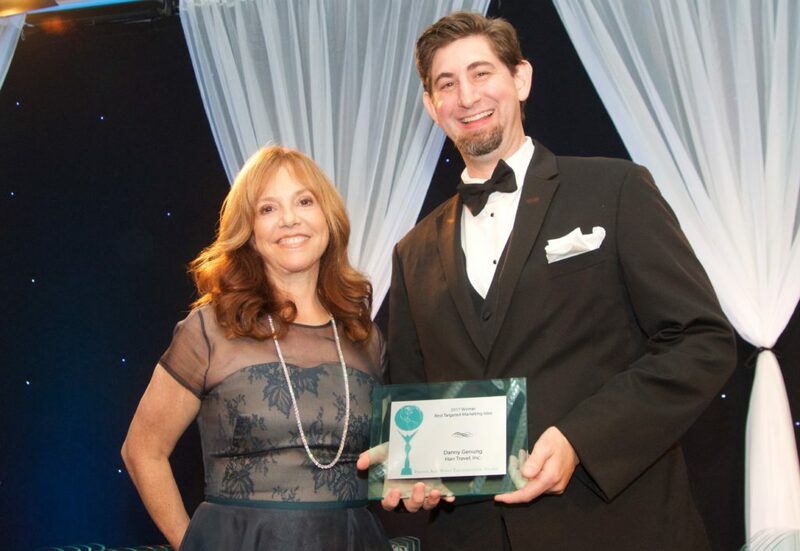 Danny accepting the WAVE Award for “Best Group Booking Sales Effort” from Vicki Freed, Senior Vice President of Royal Caribbean Cruises. LOS ANGELES – More than 150 companies, individuals and destinations were celebrated by the readers of TravelAge West as part of the TravelAge West WAVE (Western Agents’ Votes of Excellence) Awards held June 15 in Marina del Rey, Calif., at The Ritz-Carlton, Marina del Rey. Honorees were recognized in 68 categories that spanned the cruise, tour operator, airline, hotel and resort, rail vacation, travel insurance, destination and education travel fields. The annual awards gave travel agents in the Western U.S. the opportunity to recognize the outstanding qualities and services of their travel supplier partners. In addition, top travel agents were honored in four categories as part of the 2017 Trendsetters Awards, also presented at the gala. Categories included: Best Use of Social Media, Upward Bound Rock Star Agent Under 40, Best Group Booking Sales Effort and Best Targeted Marketing Idea. More than 5,000 travel agent professionals throughout the 15 Western states and readers of TravelAge West voted on the best-of-the-best from a list of Editor’s Pick award recipients that were chosen after careful review by TravelAge West Editor-in-Chief Kenneth Shapiro and the editorial team of TravelAge West. Review methods included product analysis, on-site visits, a survey of a select group of travel agents and online research. Standing on stage at the Ritz Carlton and receiving such an incredible honor from Vicki Freed, one of my industry heroes, is an experience I won’t soon forget. It is a wonderful feeling to be acknowledged by your peers as being the best at what you do. I love everything about travel and this is a major milestone on my 13 plus year path to becoming the best agent, advocate and friend that I can be for my clients. The most exciting part for me, is that we are just getting started! I wanted to say a special thanks to my wife Kristen for being an incredible partner, wife, friend and mom. Without her none of this would be remotely possible.